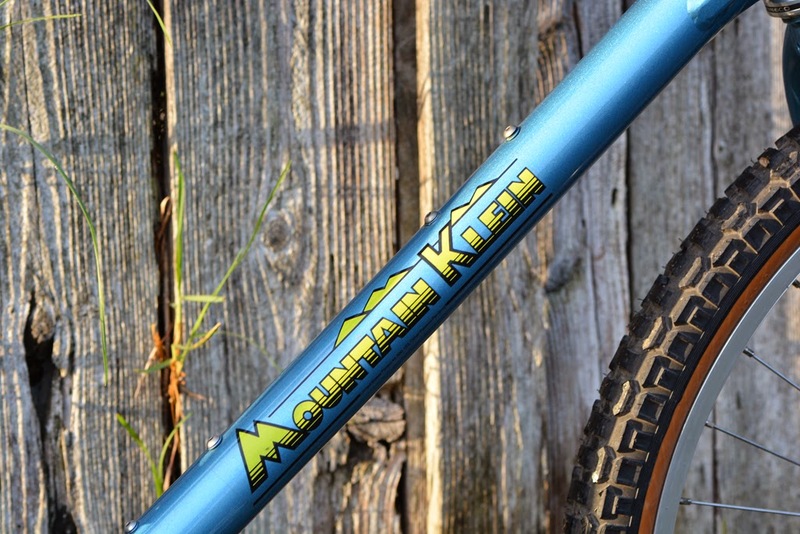 Over the years I've had the opportunity to buy several mountain Kleins, but like most Klein fans (I assume) I was only drawn to the big fork, wild paint job, 90s Attitudes/Adroits. However over the past year I've grown to appreciate the bike. 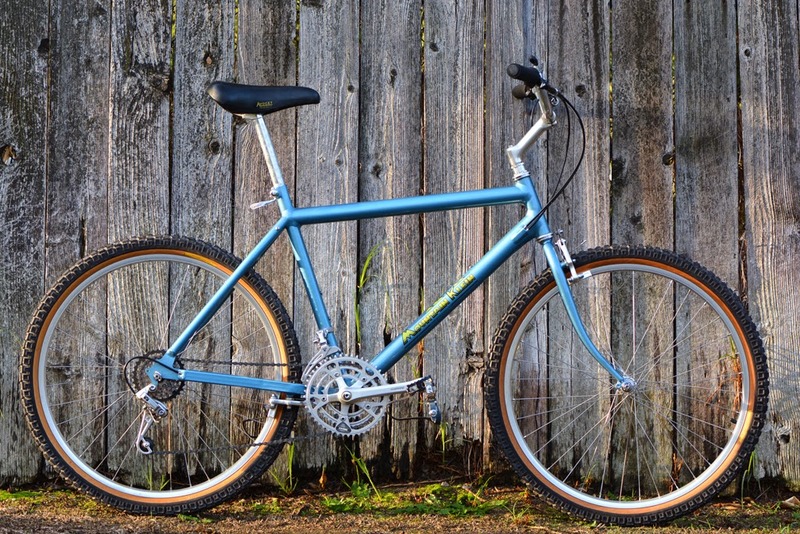 I mean, this bike largely represents genesis for every other Klein I've ever owned or wanted to own. It's where it all started. 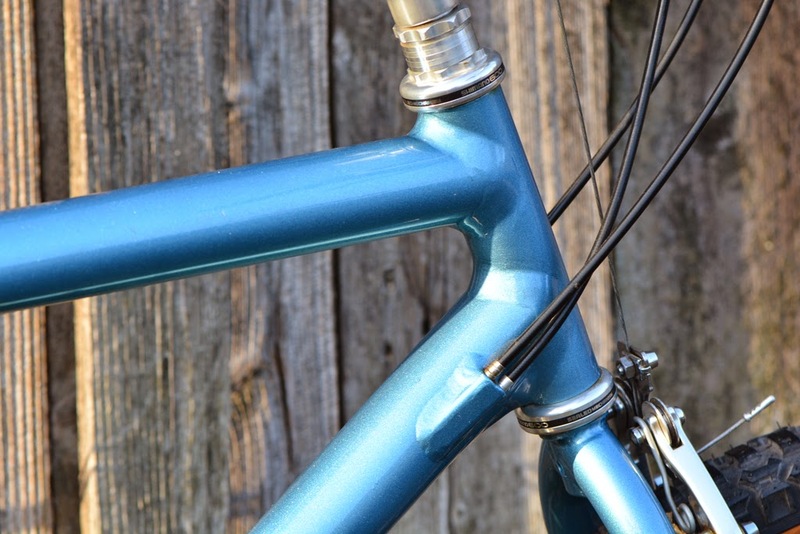 So, a couple weeks ago when this stunning Sky Blue 85 Mountain Klein showed up on eBay I decided to go for it. The bike looked stunning, a perfect time capsule. I was very excited to have won it, and for a rather reasonable price. 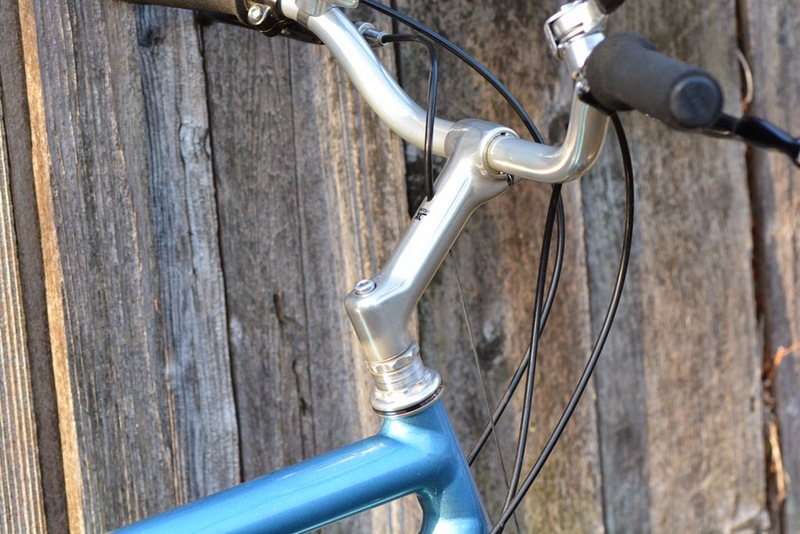 I think the rack and the jacked up stem shown in the eBay listing helped keep the bike under the radar. A couple minutes in the stand and the real bike emerged! Double down tube internal cable routing for the rear derailleur and chainstay mounted roller cam rear brake. 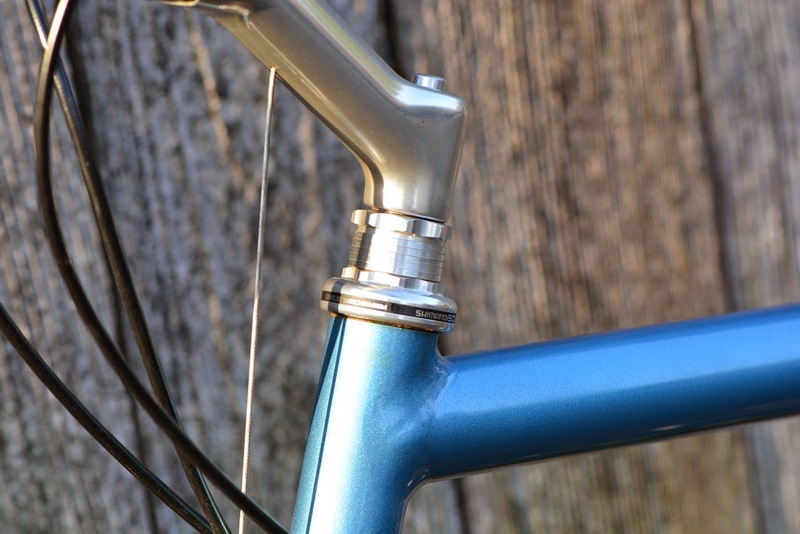 The very early MK prototypes had a beautifully sculpted cable entry for the rear derailleur. Although very nicely executed on this bike, it's crude compared to Gary's first MK. This is the only MK I've seen with a front roller cam brakes. Although not many are accounted for in my registry 100% have cantilevers in the front. Even the prototypes and MK001 have cantilevers in the front. In fact Gary's prototype has cantilevers front and rear. The RCs on this bike are the early design with drilled out arms, as opposed to the later dimpled versions. 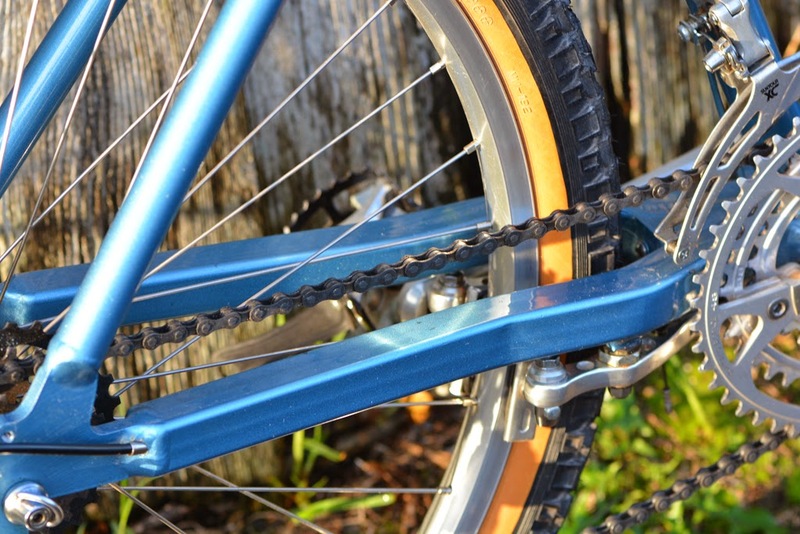 No expense was spared to build this bike back in the day. 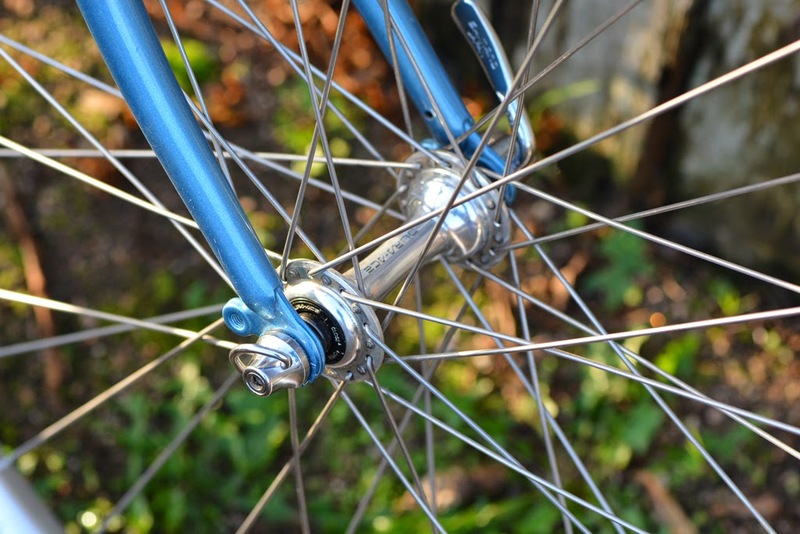 Dura ace hubs were commonly used on mountain bikes of that era, but were not common on MKs. I've only seen one other MK in my registry that came with DA hubs from the factory. 6-spd rear cluster was the pinnacle of technology at the time. The sovereign blue color is simply stunning. The welds just disappear into the paintwork, this bike may be rapidly becoming one of the favorite Kleins in my collection. 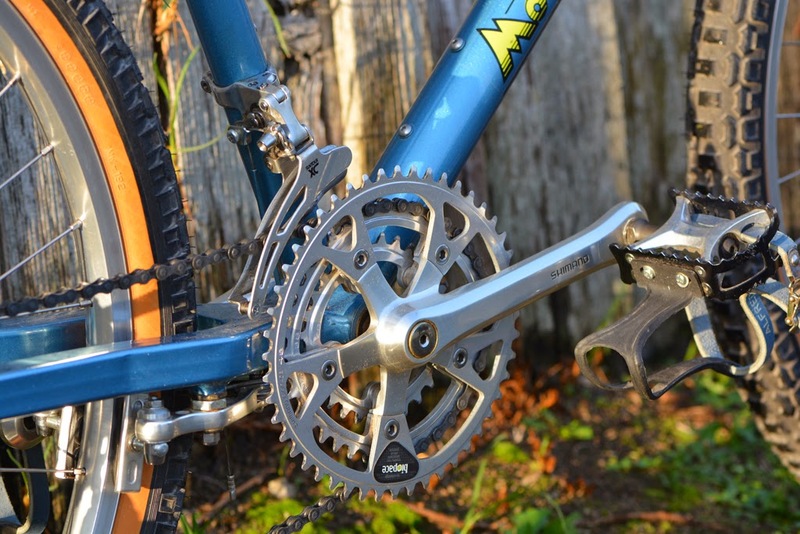 The Biopace chainrings on this bike are a bit new (date coded verify 03/86 production) so the bike received some cutting edge parts when it was built. 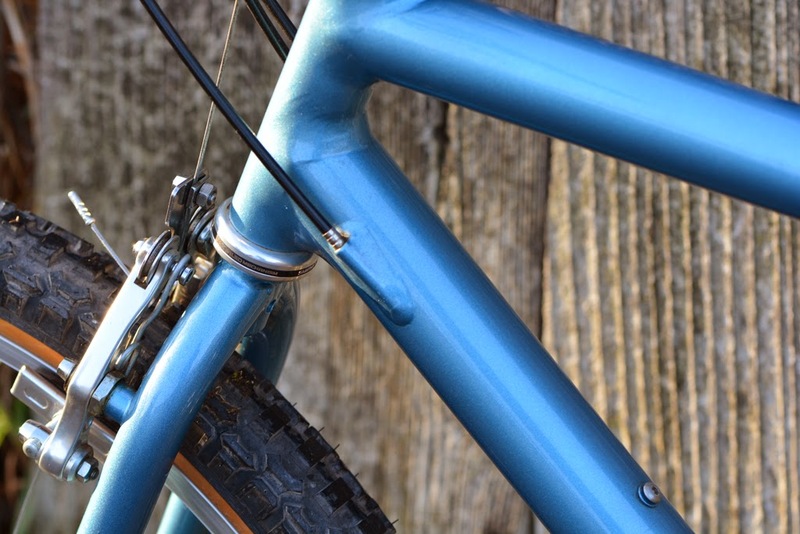 One of the more recognizable traits of a Mountain Klein are the square chainstays with internal cable routing for the rear derailleur. 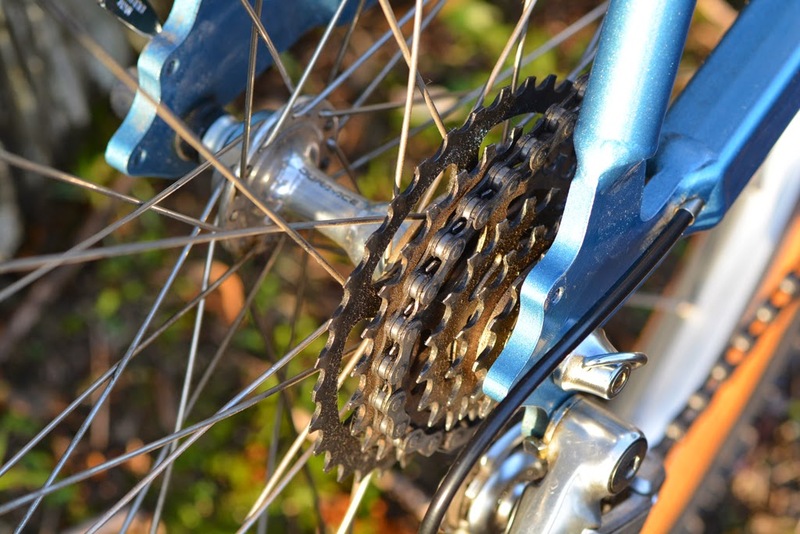 Gary started out with running the rear derailleur cable on his first prototype for the Mountain Klein and continued that design for the first two years of production. 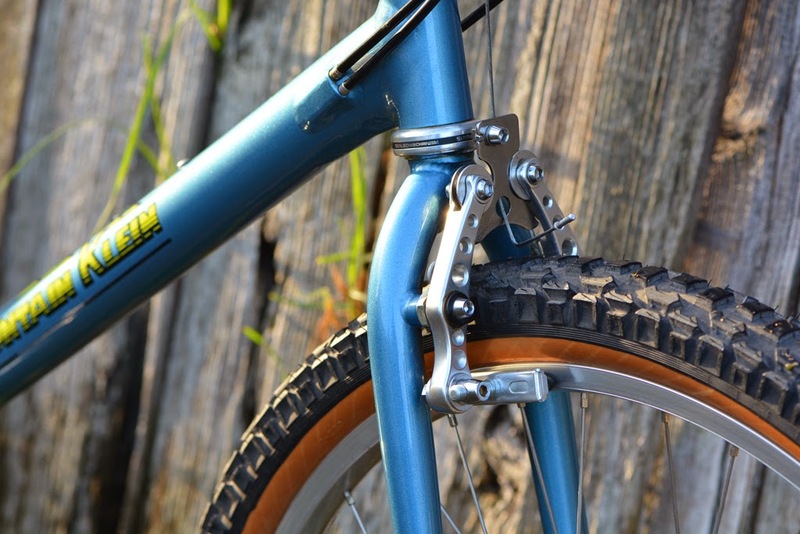 Sometime around late 86 early 87 he switched to an external cable stop and and a more conventional routing on the outside of the chainstay. 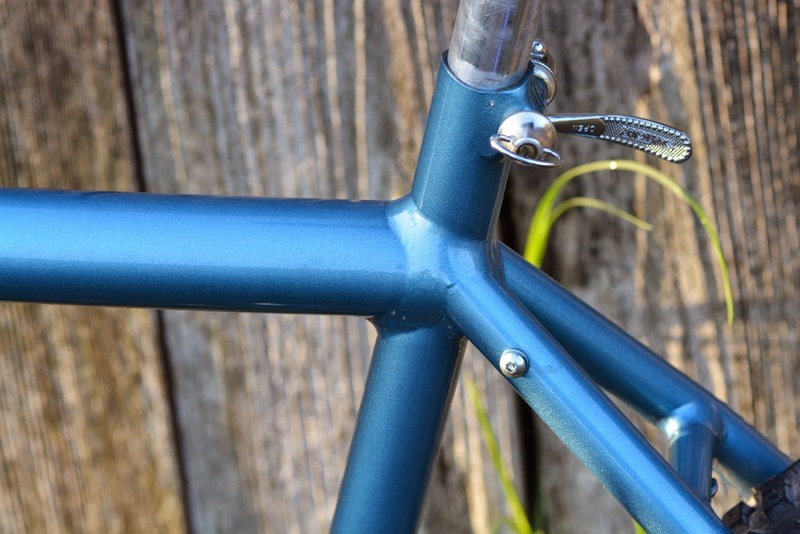 The junction between the BB and the chainstays is definitely overbuilt. It makes for a very stiff braking platform and provides some nice shielding for the roller cam brake. Unlike the prototype the welds here are clearly visible, although still very nicely done. Tire clearance is tight and I think you'd have a hard time getting anything over a 2.1 tire in there. 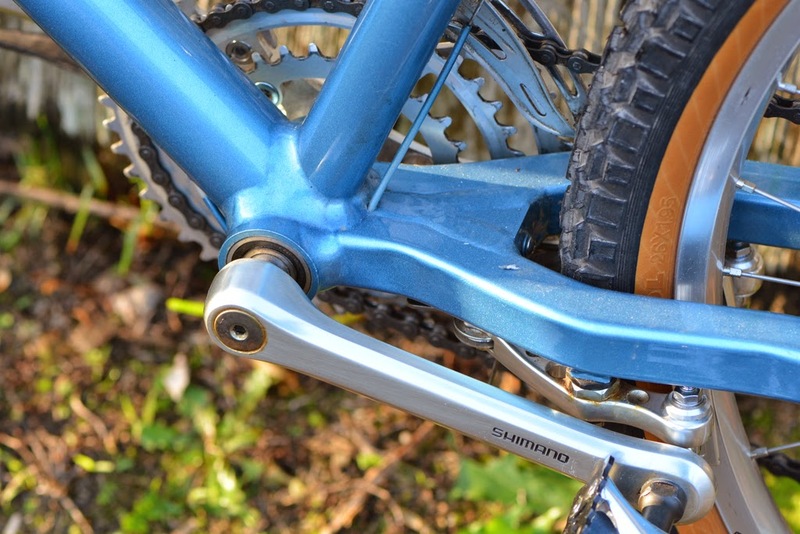 Crank arm clearance on the other hand is pretty good and there is no discernible flex under hard pedaling. 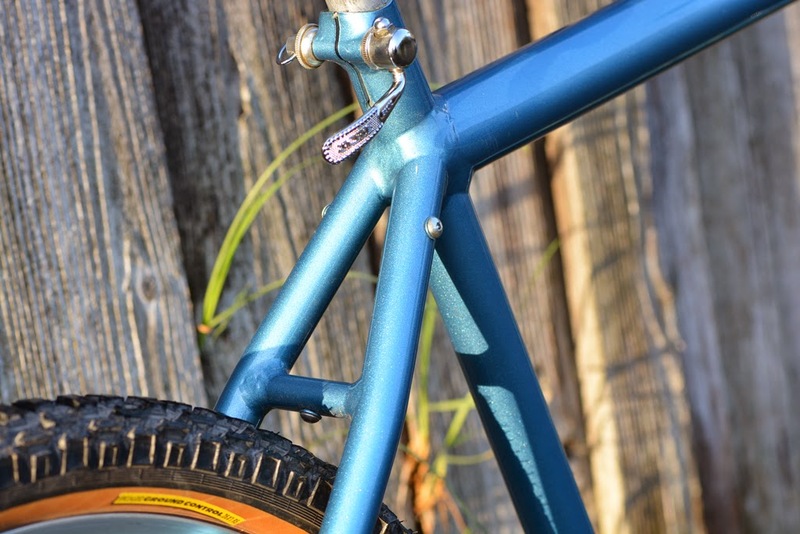 Beautiful welds were something not seen on any sort of production mountain bike before the Mountain Klein came along. The welders at Klein were true craftsmen and produced some of the most beautiful and well riding machines on the market. Shimano 600ex headset fits this bike perfectly and looks amazing coupled with the polished Suntour stem.